There’s a Greek restaurant up the street from where we live that makes really delicious Avgolemono Soup and we’ve been recreating it at home since we first tried it. 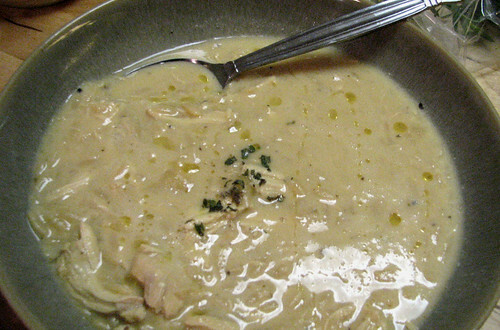 The best way to describe this soup is like a lemony, creamy chicken soup – Avgolemono actually means ‘egg-lemon’, natch. The most interesting part about it is that the creaminess comes from beaten eggs, not cream! I would put money down that this soup will cure whatever ails ya quicker than a can of Campbells! I highly recommend making this soup year round. In the winter it warms you up and in other months, the lemon brings a touch of lightness and brightness to the meal. Not only is it cheap to make, but it’s simple too. 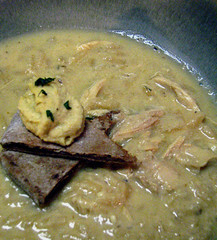 We topped ours with a grilled pita “cruton” topped with some hummus. Enjoy! Bring your chicken stock to a boil. Add chicken and diced onions (20-30 minutes in total depending on size). After about 15 minutes, add your orzo (takes about 12 minutes to cook). After your chicken is cooked (20-30 minutes), remove and let cool for a few minutes so you can shred it (throw in the freezer if time is limited). Lower the heat on your chicken stock to low just to keep it warm. Ladle about 2 or 3 cups of the stock into a bowl to cool (you will use this to mix in with the egg and lemon mixture – must be cool to prevent it from curdeling). Squeeze the lemon into a Pyrex measuring cup (or something with a spout). Meanwhile, the fun part. Crack your eggs in a large bowl and vigorously whisk until the mixture looks foamy. Slowly add (while whisking at the same time) your lemon juice into the foamy egg until it is completely incorporated. While continuing to whisk the foamy egg mixture, slowly add your warm/cool stock that you reserved in another bowl from step 3 until it’s completely mixed in with the egg mixture (again, make sure it’s not boiling hot – you don’t want this to scramble!). Slowly add this mixture back into the pot. Shred the chicken and add back into the pot. Add oregano. If extra liquid is needed, add a bit of water. Allow to come back to a decent temperature and serve immediately. @Silkee: thanks so much! We love that you’ve made our recipe and enjoyed it. Please visit us again! ← Poll: Ideas of Paris Up In Smoke?